Maintenance and service is a key contributor to the total cost of train ownership. 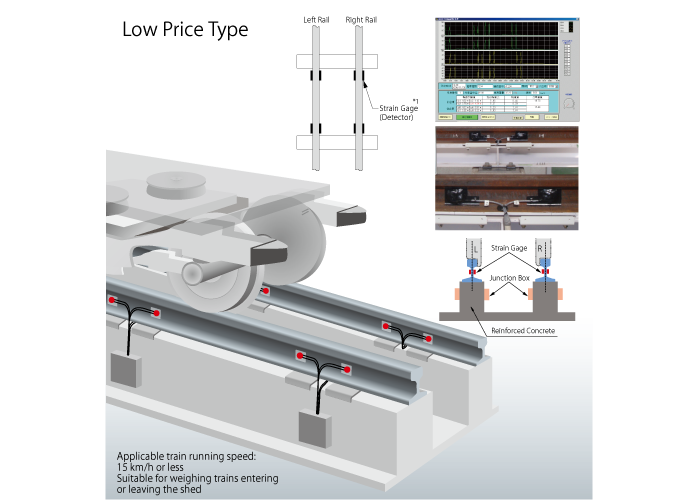 The total cost of maintaining rolling stock often exceeds original equipment purchase price. LORD MicroStrain® wireless sensing systems provide fleet operators with a quick and cost-effective path to embedding health sensing capabilities on both new and existing critical components for continuous, automated condition updates. Have you ever wondered if there is a vibration condition monitoring system that can be installed anywhere and then monitored from anywhere else? Even on your smartphone? 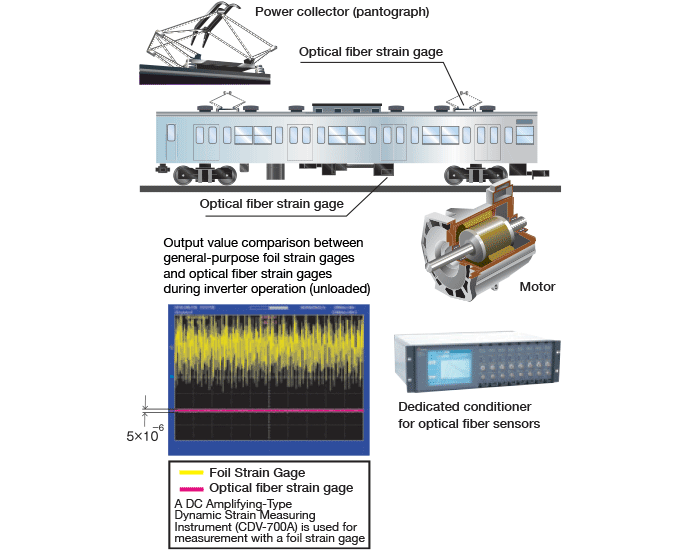 Optical fiber strain gage is resistant to electrical noise and most suitable for the strength measurement of inverter motors. 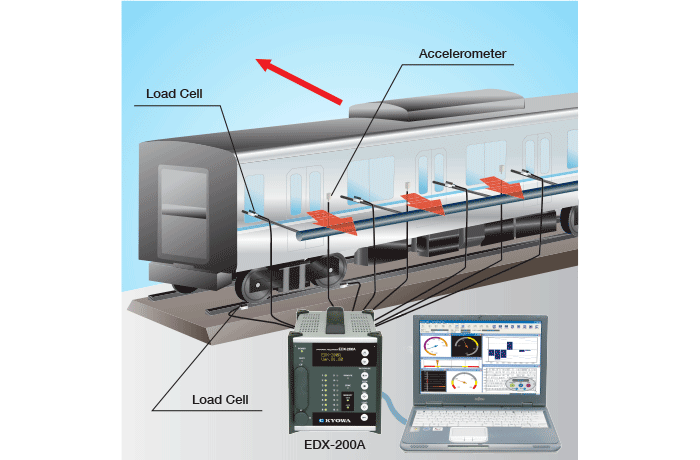 KYOWA Memory Recorder/Analyzer EDX-3000B enables to measure wind pressure applied when high-speed trains enter tunnels and pass each other, by placing Pressure Transducers (PS) on the outside front of the train. KYOWA Universal Recorder EDX-200A enables to perform model experiments of vehicles subjected to side winds, by using KYOWA Load Cell (LUR-A-100N, LMA-A-100N) , Accelerometer, and KYOWA Universal Recorder (EDX-200A). KYOWA Universal Recorder EDX-200A enables synchronous measurement for up to 32 channels per unit; up to 8 units can be used at a time. 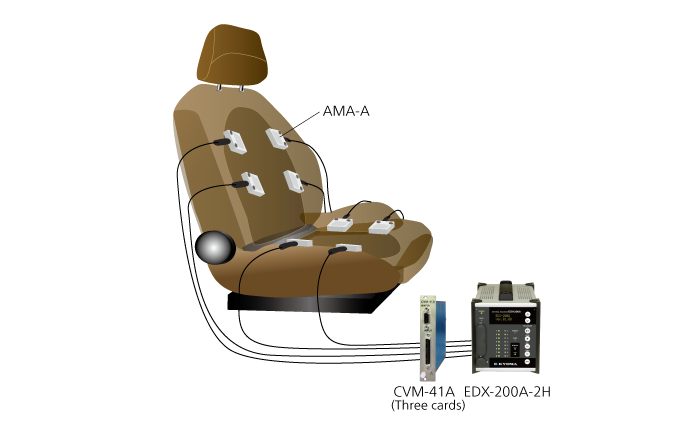 Enables to perfom multichannel on-site tests, such as the ride quality testing of vehicles, with reduced preliminary arrangement. 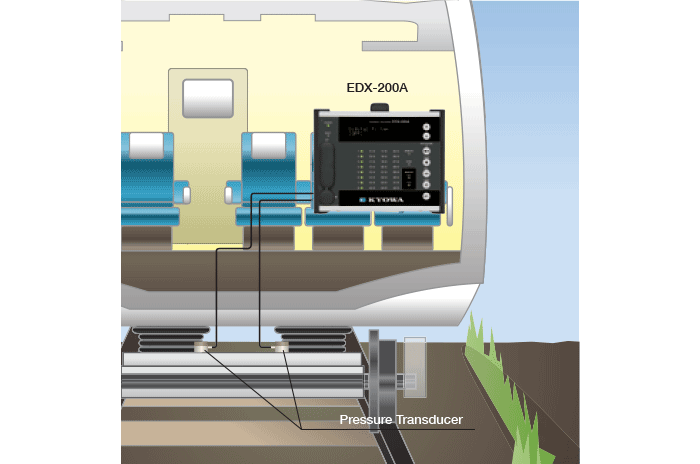 KYOWA Universal Recorder EDX-200A enables to measure suspension control pressure for transverse vibrations of trains (pressure to adjust air springs), by using KYOWA Pressure transducers (PGMC-A). 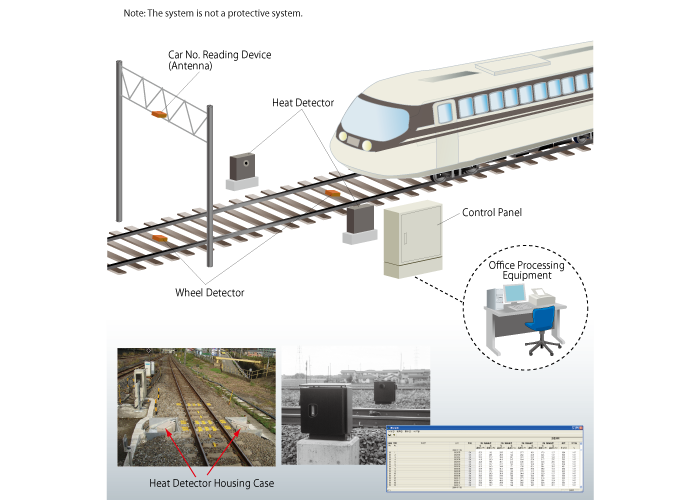 The heat detection system enables monitoring running trains to detect any possible abnormal temperature of underfloor equipment, axle boxes and wheels for alarm. Axle load measuring instrument prevent derailments by accurately measuring any imbalance in vehicle wheels. The wheel load weighing system enables Improvement of riding comfort and safe operations by checking any unbalance of wheel loads. 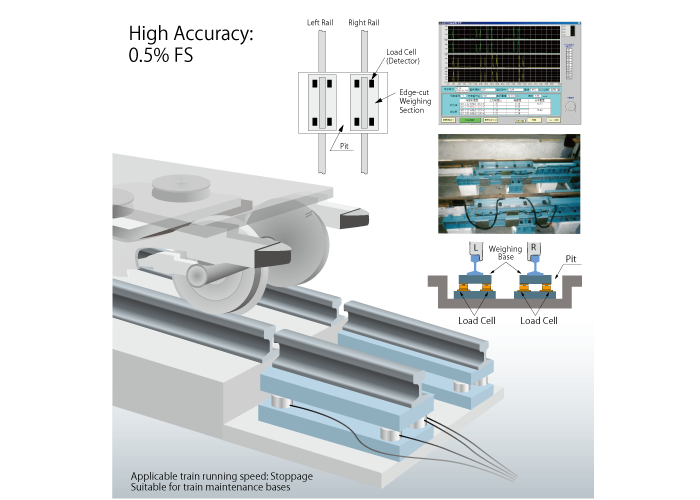 The shear strain gage method ensures easy installation at low price. ※1：It is recommended to periodically inspect, calibrate or replace the strain gages. The direct load cell method ensures easy installation. 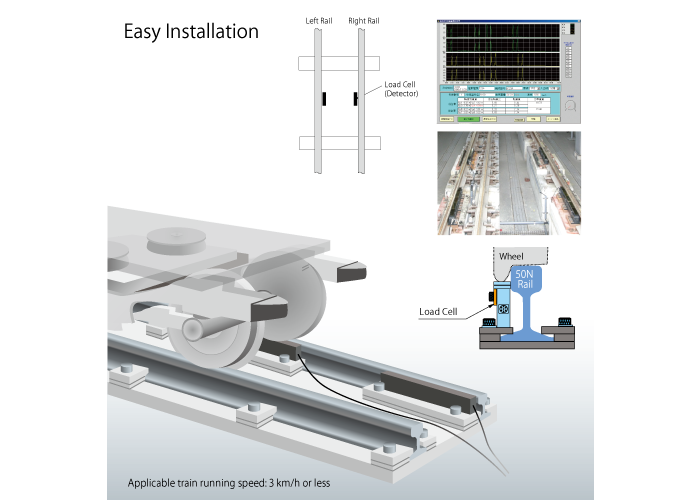 The under-rail load cell method features an independent weighing section, thereby ensuring highly accurate measurement. 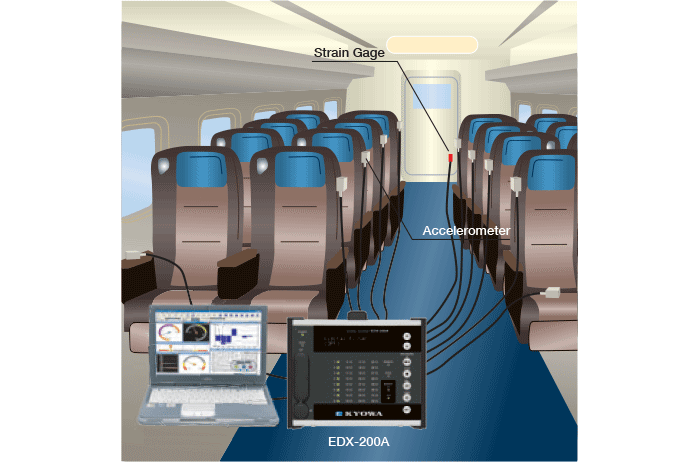 Non-inductive strain gage enables to measure stresses on the control panel and connected parts of the body with noise resistance. 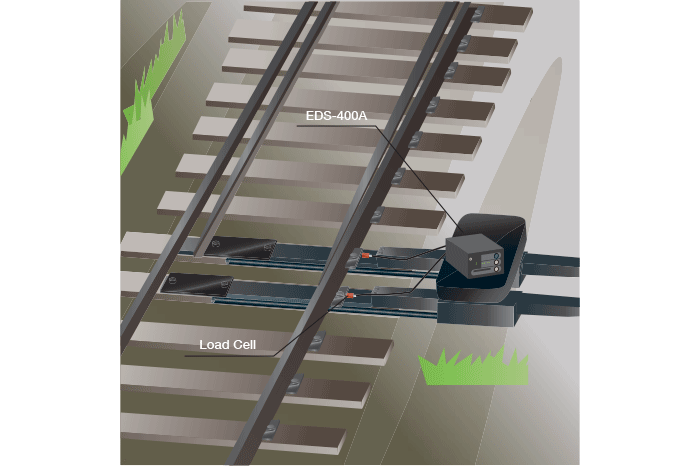 KYOWA Compact Recorder EDS-400A enables to measure the load applied to the rod at the time of point switching, by using a KYOWA Load Cell (LUX-B-20KN) and a Compact Recorder (EDS-400A). 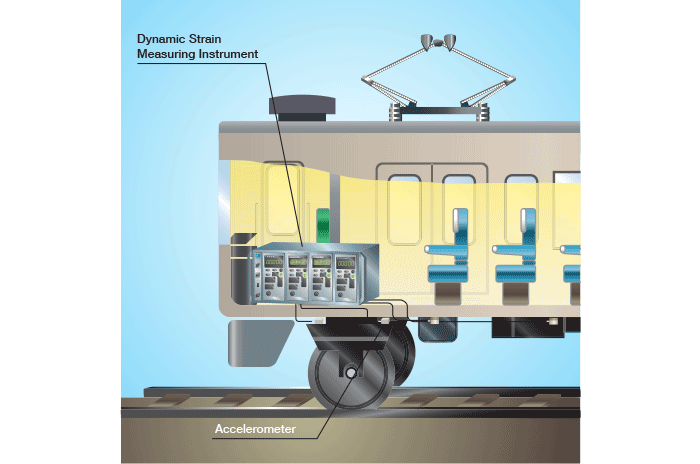 KYOWA Dynamic Strain Amplifiers DPM-950 series enables to detect rail abnormalities from signals sent from accelerometers affixed onto the top, bottom, left, and right sides of the wheeled platform and to obtain maintenance information.